Russian Christmas gift boxes for sale! 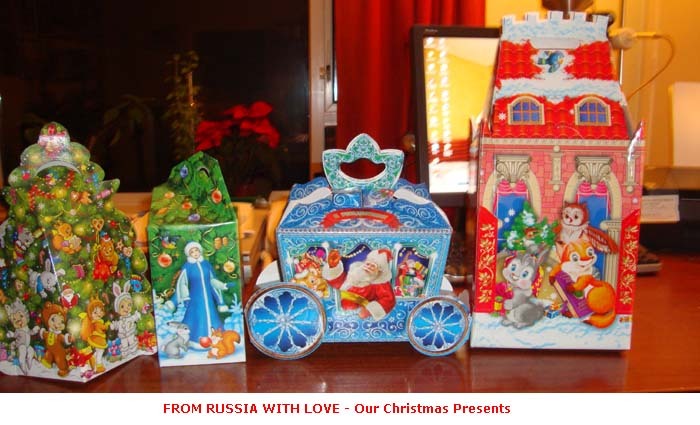 This is a small sample of my Russian Christmas boxes.......and later will post many photos of them. Those boxes look like the ones we gave chocolates to our neighbours in... they helped us some times starting the car. Regarding the price on the picture... I guess we should start opening a webshop.. I aim to become a millionaire by selling various Russian gifts in the British isles....... so I can offer a life of luxury to my hard working wife! Playing with certain ideas about the shop.........but I wonder.... would I 'll be accused of advertising a commercial business if I post some more pictures of these Christmas gift boxes here? and I have around 35 of them in various different styles for sale. All writing on the boxes, is in Russian ...... and none in English! All of them are flat packed and have to be assembled. The assembly is very easy. If you can assemble a Tesco wine box.... then you can assemble these ones too! See Prices and cost for posting below. Did you eat the candy that was inside ? It's not a dog...this is how I look. Selling prices for the Christmas 2011 boxes. I still have a small number of Christmas boxes of various sizes and designs to sell and while I have posted few photos for some of them or similar, it’s not practical for me to take photos for each one and more importantly I don’t want to assemble them to take photos. and as you know the post office right now is very busy. There are three types of boxes. A) Small Laminated, .....B) Medium Laminated and C) Larger cardboard ones. The small laminated boxes take up to 400 gr weight and cost £ 2.50 each. All packets will be posted 1st class and well packaged for protection. As you know the costs for posting with the Royal Mail has gone up and for this reason, when you have decided how many boxes to order then I will have to check with the Post Office the cost and let you know. Contact me for Payment details: Will accept , cheque, Direct payment to my Bank account or Paypal. I hope you all find these boxes useful and a nice idea. Bear in mind writing on the boxes is in Russian. Last year, I promised to investigate the possibility of importing more of these CHRISTMAS GIFT BOXES and create a web site for this purpose. The site is ready and live .... see link at the end of the post. The Russian printers don't have ready boxes to sell, early in the year, as they print and distribute them at the end of October or in November. Shipping cost is prohibiting and I do not include the Customs cost. If I can discover an economical source to import again these boxes, I will let you know. Please accept my apologies for the small number available to sell. I have created the web site and it's live, I am selling a small number of these gift boxes and you can visit the site by clicking either the logo at the top or the link below. AT WIZ'S RUSSIAN GIFT SHOP FOR SALE! To celebrate Christmas and New Year, we have imported from Russia a small number of Russian Christmas gift boxes. Russian parents buy these boxes, fill them with special Christmas confetti and give them as presents to their children for the New year and also for Christmas. We have a few of these Russian gift boxes for sale. You can order them individually or as a small bundle. Boxes are flat packed with Russian writing and must be assembled. If you can assemble a card board wine box, you can assemble these boxes too! Make a note in your festive diary to visit my web site, to avoid disappointment. These Christmas boxes will make a loved one very happy, bringing back many happy childhood memories. Merry Christmas to you all.